Who is it for? 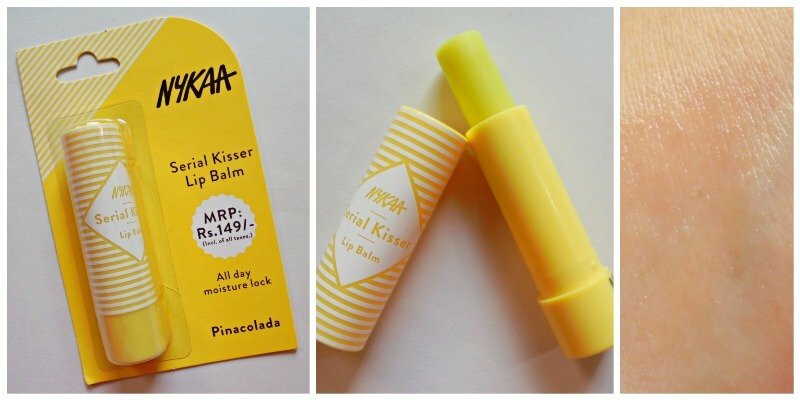 Nykaa Serial Kisser Lip Balm Pinacolada is a hydrating lip moisturizer that has a fragrance similar to the popular cocktail pina colada. If you love pineapples then you will love this lip balm for sure! This lip balm comes with a cute looking round bullet with line patterns all over the lid. The body of the bullet is colored in pastel yellow; the exact color of pina colada drink. The packaging is quite secure and sturdy; I have had no problem to carry this tiny bullet in my purse. The patterns are printed on the surface of the plastic lid so they might wear off after some time. Though the lip balm looks pale yellow in the stick, t gives transparent finish on the lips. The formula is moisturizing and rehydrates dry lips. It does not feel sticky so it can be applied under matte lip color. The two main ingredients of pina colada drink are pineapple juice and coconut milk. The fragrance of this lip balm is also a blend of pineapple and coconut. It has a rich pineapple toffee like the mild smell. I just love the fragrance! I have tried the non-alcoholic version of pina colada and this lip balm kind of imitates that fragrance. As a lip balm, it is above average. The formula is vegan and paraben free. The consistency is the medium thick and very nourishing formula. It helps to heal chapped lips if you keep reapplying from time to time. The lips also become supple that way. It does not come with SPF so it can’t be worn at the time of sun exposure. It becomes easy to exfoliate the lips after an overnight application of this. It can also be used under liquid lipsticks. I love the formula and the fragrance so this one is on the repurchase list! I will suggest this affordable lip balm to all.